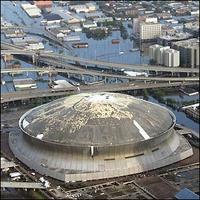 In the aftermath of Hurricane Katrina, some reports say the Superdome will be knocked down. The Louisiana Superdome was so heavily damaged during Hurricane Katrina and its aftermath that it likely will have to be torn down, a disaster official working with the governor’s office told CNN. The operator of the Louisiana Superdome said Wednesday that talk of tearing down the stadium is “purely conjecture and speculation.” Doug Thornton said the building was damaged during Hurricane Katrina but it’s structurally intact. The roof leaks, there are problems with electrical and mechanical systems and it’s full of trash and human waste from thousands of people who sought shelter from the hurricane. In addition, Katrina sheared away much of the roof’s covering, and water leaked into the stadium when it was used as a shelter for thousands of stranded residents. Thornton said it will take at least 45 days to assess the damage. Ed Anderson of the New Orleans Times-Picayne provides these additional details. With electrical problems and some floodwaters still standing in the Superdome, state officials said the future of the building has not been determined. But they did say this: damage to the structure could hit $400 million, and it’s unlikely the facility could be used for at least a year. Coulon refused to say whether he or state officials prefer to demolish the Dome or try to renovate it. The engineering study and assessment will help determine the course, he said. Doug Thornton, a regional vice president for SMG, the company that manages the Dome and the nearby New Orleans Arena for the state, said the Dome’s interior was trashed during the evacuation and must be decontaminated before engineers look at the structure. “It may take us two to three weeks to get it cleaned up,” Thornton said. He said it may take another 45 days to determine how sound the structure is.